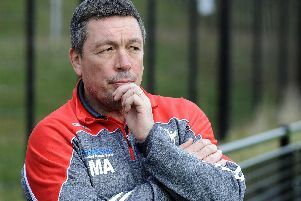 Sheffield Eagles will be without versatile full-back Corey Makelim for the rest of the season, but there is better news on winger Iliess Macani. Aston was without Macani for the recent victory over Swinton, whilst Makelim was forced off after sustaining a shoulder injury. The Eagles chief confirmed that Macani missed out with a bout of tonsillitis, but will be back when the Championship Shield resumes with a home game against Dewsbury Rams a week tomorrow. But it is season over for Makelim who Aston revealed is in much better shaped than initially feared, as he left the field at Heywood Road in some discomfort. “Corey will be out for the season now because he has sprung his shoulder,” he said. “There is a bit of ligament damage but it is not as severe as we thought it was, but it is still bad enough to keep him out for the season. The initial reports after the game were that Makelim could have suffered a severe dislocation, and the USA international certainly felt the impact of the injury as he was helped from the field. But after treatment, time with the medical team and a trip to the hospital it looks as though Makelim’s long-term prospects are positive, despite the blow of missing the final five rounds of the 2018 campaign. “He'll be fine in the long-term,” Aston confirmed. “He popped his shoulder, we thought it was a bad dislocation, it has come out but it went back in. The strain of the ligaments around it will take a bit of time to heal up. He was in a massive amount of discomfort, but he has been to the hospital and they have cleared him of the dislocation. It’s back in, he'll be fine but it'll take a bit of time.